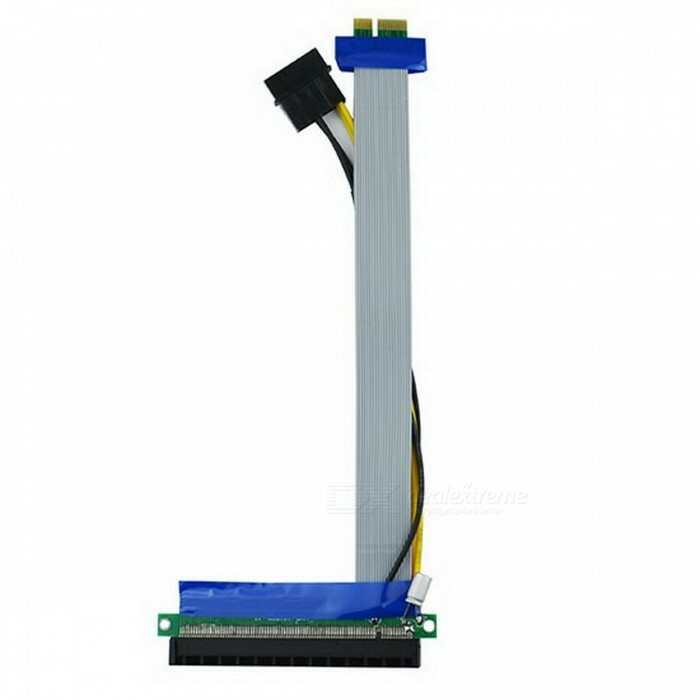 Message boards : Graphics cards (GPUs) : PCIE Riser? Did using PCIE Riser change something on the performance? Using x1? Message 39706 - Posted: 25 Jan 2015 | 20:55:55 UTC - in response to Message 39701. Using one is likely to increase your error rate somewhat. They're not very reliable. Depending on the performance of your GPU and PCIe version used 1x is really slow. 4x PCIe 3 is still approximately enough for the current GPU-Grid app, though. Message 39742 - Posted: 27 Jan 2015 | 9:45:19 UTC - in response to Message 39706. From past experience I would agree, but you can keep the slightly higher error rate down by using a good PSU, not overclocking, and running cool (which is easier anyway). Well made (copper wire/connector) risers are ok, but there are some low-grade (cheap alloy) versions. If it looks as cheap as tin, it is. As GPU's take power from the PCIE slot it's a good idea to get a riser with a power cable (often molex). This covers the PCIE power loss from the cable length and additional connection. Overclocking on a riser would be pushing it, but I expect the Maxwell's are a lot more power resilient and reliable on a riser than the Keplers and previous generations. Message 40677 - Posted: 29 Mar 2015 | 13:41:21 UTC - in response to Message 39742. Experiment to assess using PCIEx1. Ran an e1s5_2-GERARD_FXCXCL12_LIG_11543842-0-1-RND7987_0 GPUGrid task on a GTX670 mounted via a molex powered PCEIx1 to PCIEx16 riser. W7x64 (WDDM overhead), also running Einstein on my integrated gpu (significant overhead there too), and 5 CPU tasks (impacts somewhat on performance, a few percent at least). The GTX670 (170W TDP) was downclocked by 65MHz to stay closer to the 2*6-pin (150W) power margins, though the molex power connector could in theory supply 12V*5A=60W. It ran at 95% power according to MSI Afterburner. For comparison reasons I was not hoping for one of these new extra-long tasks, but others report they run slightly hotter and they do run much longer, so it was more likely to fail than the usual long tasks. Although I'm also not directly able to assess the relative performance loss (PCIEx1 vs PCIEx16) due to running multiple CPU and iGPU tasks, and limited task history, it did test proof of concept in a stressful environment. Performance was ~18% slower than optimal (going by approx. relative performances of the 970 and 670) but it should be possible to get within 15% of normal performance (for that card). Note that if the GPU was actually in the system it would be a second GPU anyway and would thus be operating at PCIE 3.0 X8 (not PCIE 3.0 X16). A third GPU would also be operating at PCIE 2 X8 or X4. So any small difference between X8 or X4 and X16 should be considered. While using PCIeX1 worked reasonably well (no reported task recovery), the exact loss due to PCIEx1 is not known. From experience, it's likely that the loss scales with GPU performance and varies by task type. So the loss on a GTX750Ti would for example be around about half the loss on a GTX970 and for some tasks it would be larger than others (the smaller the atom count in the model the greater the loss would be, I think).